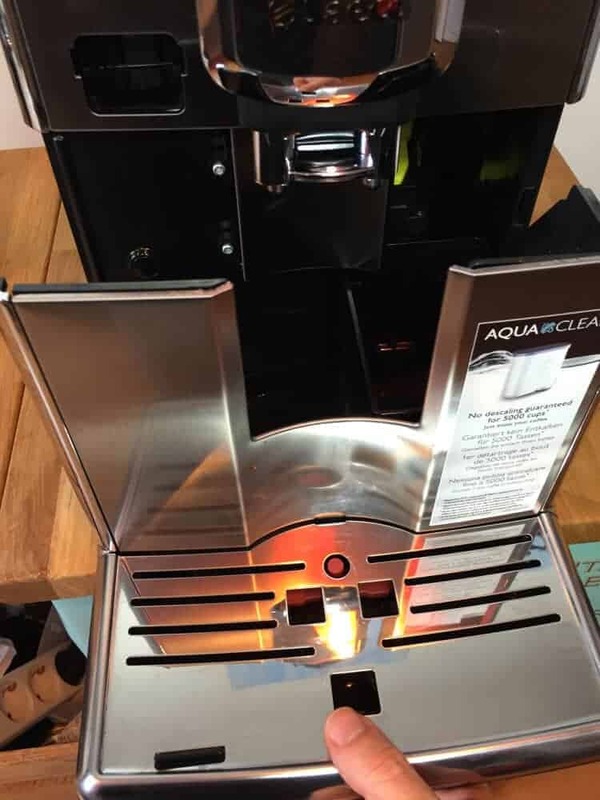 I’ve thoroughly tested the Gaggia Anima Prestige super-automatic espresso machine, and I’ll share my experiences with this machine. 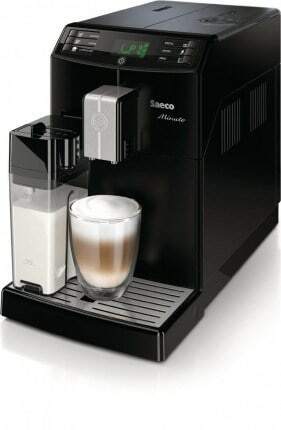 Note: In Europe this machine is marketed as the “Saeco Incanto” super-automatic espresso machine, but in the United States it is sold under the name “Gaggia Anima Prestige.” Despite the different name, the machines are basically identical. 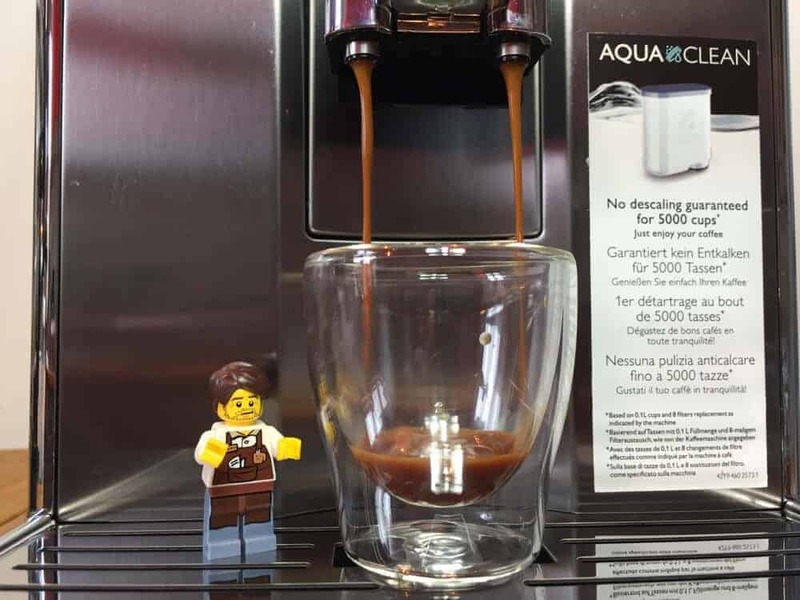 To learn more about the super-automatic espresso machines I’ve tested, check out the reviews here. Out of all the automatic espresso machines on the market, the Gaggia Anima Prestige is among the models with the best balance between price and performance. It is well made and feels sturdy, yet it is still small and elegant. You won’t find a lower-priced espresso machine with so much stainless steel. Overall, the machine seems very well designed. It’s nice and compact. Its milk system, which has the milk carafe mounted directly onto the machine, makes it one of the most space-saving countertop espresso machines that I’ve reviewed. Chic, tiny and shiny! You won’t find a lower-priced super-automatic espresso machine with so much stainless steel. It has a large display, and it’s very user-friendly. I especially enjoyed making espressos with this machine. It let me choose the exact amounts of coffee and water I wanted to use. It is also quick and easy to clean by hand. The only thing that you need to regularly take apart is the milk carafe, which is a bit more complex than other automatic latte machines. The Gaggia Anima Prestige has a removable brewing unit, which is an advantage when it comes to cleaning or replacing the part. The quality of the milk foam is good, and you can easily make a latte macchiato, an espresso macchiato, a caffe latte, or a cappuccino. Based on its overall performance, I believe that the Gaggia Anima Prestige is one of the best super-automatic coffee machines in its price class. Below you will find my complete review of the Gaggia Anima Prestige. You can also check its current price on Amazon here. The Saeco Incanto HD8914/01 is almost identical to the Saeco Incanto HD8917/01 (used in my tests) – the only difference is with the milk frothing system. With the HD8914/01 model, you feed the milk directly from any container into the cappuccinatore milk frothing system. The advantage of doing this is that you don’t need to clean a milk carafe. 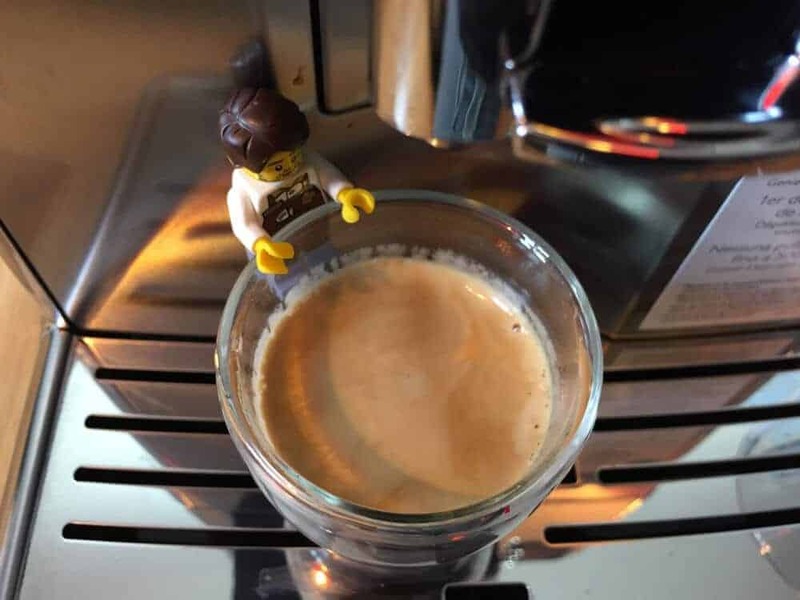 However, the disadvantage is that, once your espresso is ready, you then need to remove your cup from the espresso spout and put it under the milk foam wand. In other words, you need to stay with the machine while it is making your drink. I like both versions, so you will have to decide which one is best for you. Since the two machines are otherwise identical, I won’t be doing a separate review of the HD8914/01 model. Here’s a link to a downloadable pdf of the Gaggia Anima Prestige manual. 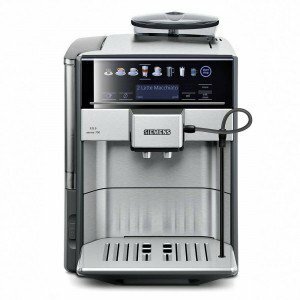 There’s another Saeco super-automatic espresso machine with an integrated milk carafe: the Saeco HD8763 Minuto. In terms of functionality, it’s very similar to the Gaggia Anima Prestige. However, I think it looks noticeably cheaper. I would think twice before buying the Saeco Minuto if the two models’ price difference is more than about $250. 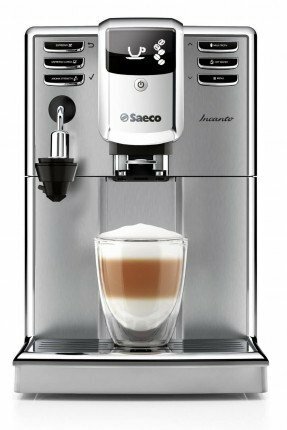 The Saeco Minuto is also available in a “Pure” model, but that one doesn’t work with milk, so it can’t make any milk foam. The Anima Prestige has a nice, large display, which makes it simple to use. 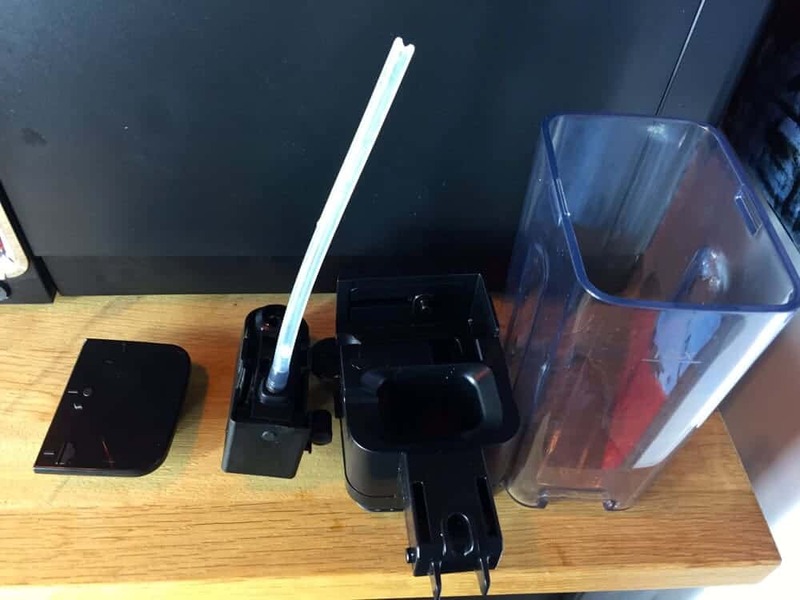 You can use the display to easily set the amount of coffee you want to use and make, and it will even let you know if the brewing unit or the drip trays aren’t correctly installed. The first thing you should do is thoroughly wash out the water tank. Same goes for the milk carafe. After you’ve screwed in the water filter, the machine will first need to run some water through the filter. We will talk more about that later. You also have to program the water hardness into the machine. Later, we will also see how to determine the hardness of your water. Overall, the Gaggia Anima Prestige is very easy to use. 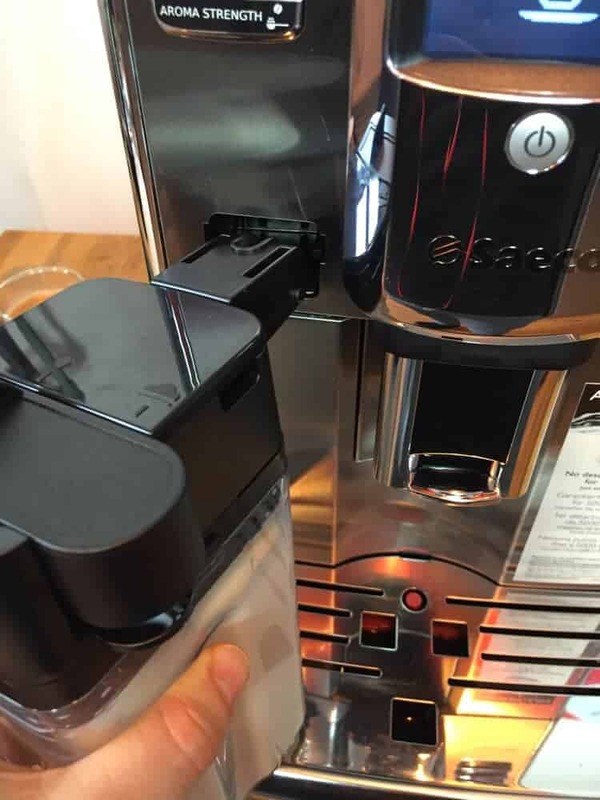 This super-automatic latte machine uses a milk carafe that saves space by attaching directly to the machine’s front. When you are done making your coffee, you can easily take off the milk carafe to store it in the refrigerator. In this first picture, you can see I have just filled up the milk container. Now, I simply attach the carafe to the left front side of the espresso machine. When the milk carafe clicks, it is properly in place. Next, slide the milk spout to the right. That way, the milk will pour directly into the cup below. 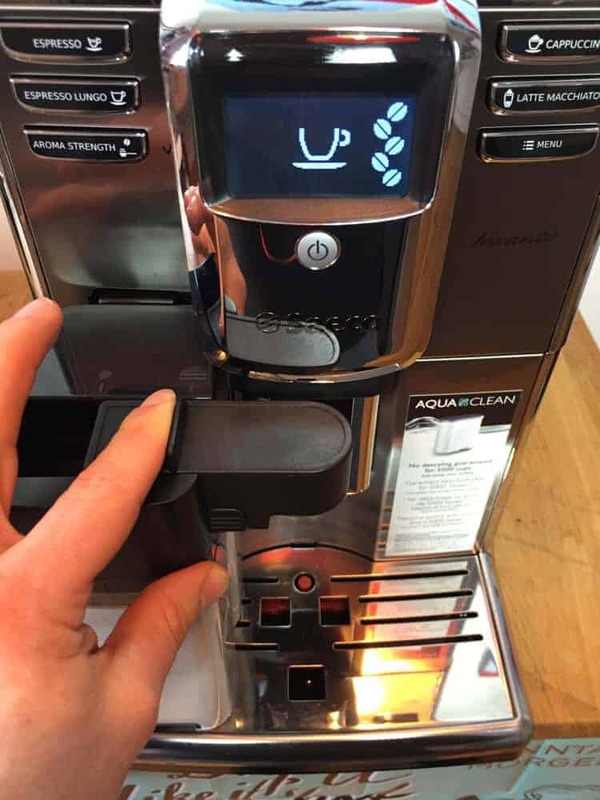 This is very useful because it means that you can simply leave your cup in one place for a cappuccino or a latte macchiato, and you don’t have to move it. 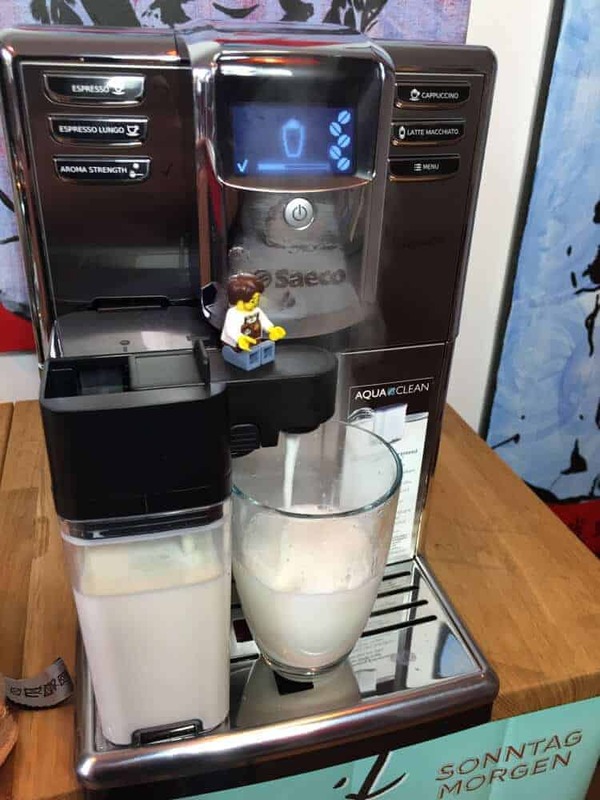 Our trusty LEGO barista, Larry, supervises the milk foam production. For the first second or so, just a few drops of water come out, but then good milk foam starts to flow. The milk foam comes out at a good temperature, which is important because your drink’s temperature will always strongly depend on the milk’s temperature. What I especially like about this milk frothing concept is that it is very space-saving. 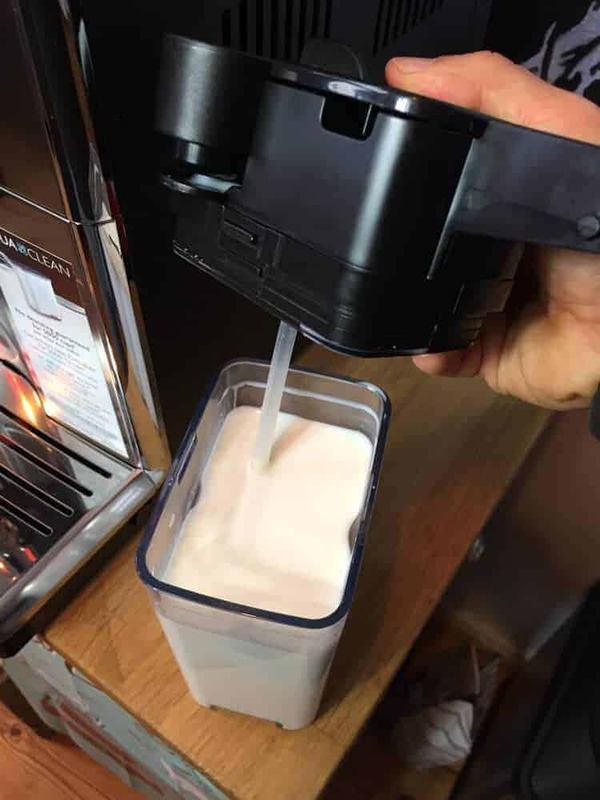 The machine is already narrow, and adding the milk container doesn’t take up any extra space. 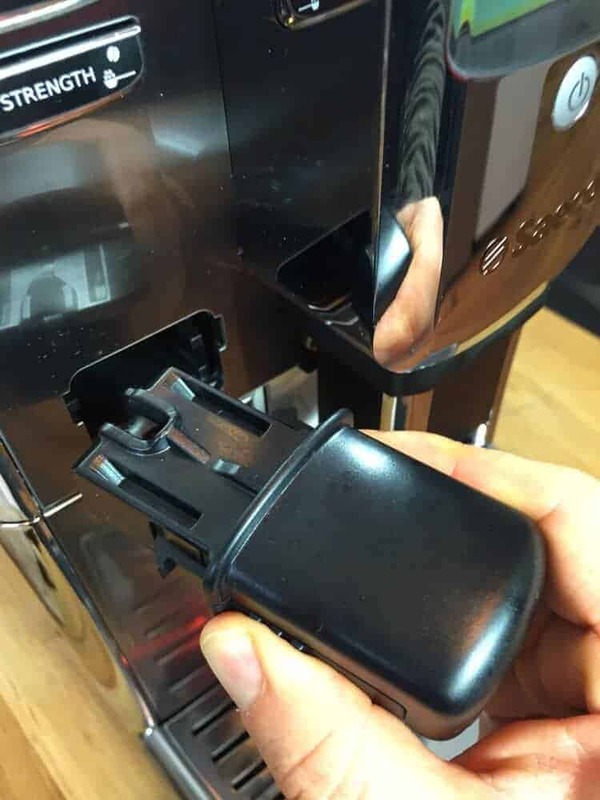 With many automatic espresso machines, you need to place the milk container next to the machine, which obviously takes up more room. If you want an example of what I’m talking about, check out my review of the Melitta Caffeeo CI. It’s also a great machine, but it takes up more space than the Gaggia Anima Prestige. The foam quality is solid. There are usually a few larger bubbles on the top, but otherwise it’s fine and creamy. When making an espresso, I set the coffee strength to the maximum level. In this case, that means that I selected the “five coffee beans” level on the machine. Larry approved, as you can see. I also put the grinder on its finest setting. With the Anima Prestige, you can use the machine’s memory to program the amount of espresso you want. 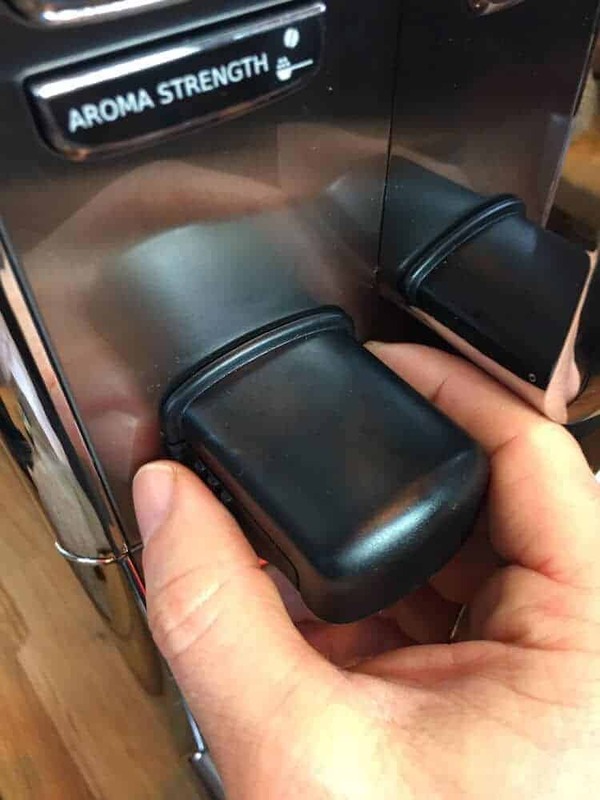 To do this, hold down on the button with the espresso cup icon on it. That will put you in the “MEMO,” or memory, setting. The machine will now begin brewing and pouring the espresso. 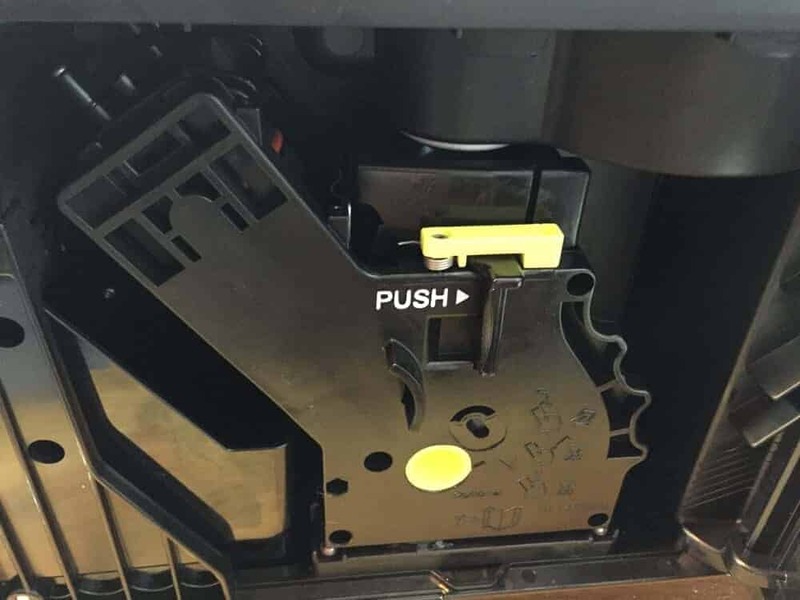 Once the desired amount of espresso comes out, press the “OK” button to store the amount in the machine’s memory. 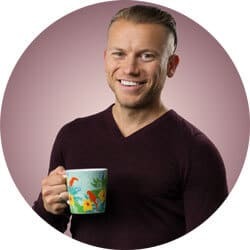 You can either use a shot glass to measure a bit less than 1 ounce (between 20 and 25 milliliters), or you could also weigh it on a kitchen scale to check the amount. The espresso has a nice, uniform crema, and even had some shiny dark spots. That’s not always the case with all automatic espresso machines. The espresso had a strong flavor. When comparing different super-automatic espresso machines that I’ve reviewed, the espresso I got from the Gaggia Anima Prestige was above average. Of course, an espresso machine can only make good espresso if you use the right beans. I recommend using freshly-roasted coffee beans from a roaster that places value on the coffee’s origin, as well as on all the people in the production chain. However, the most important aspect to consider is still taste. 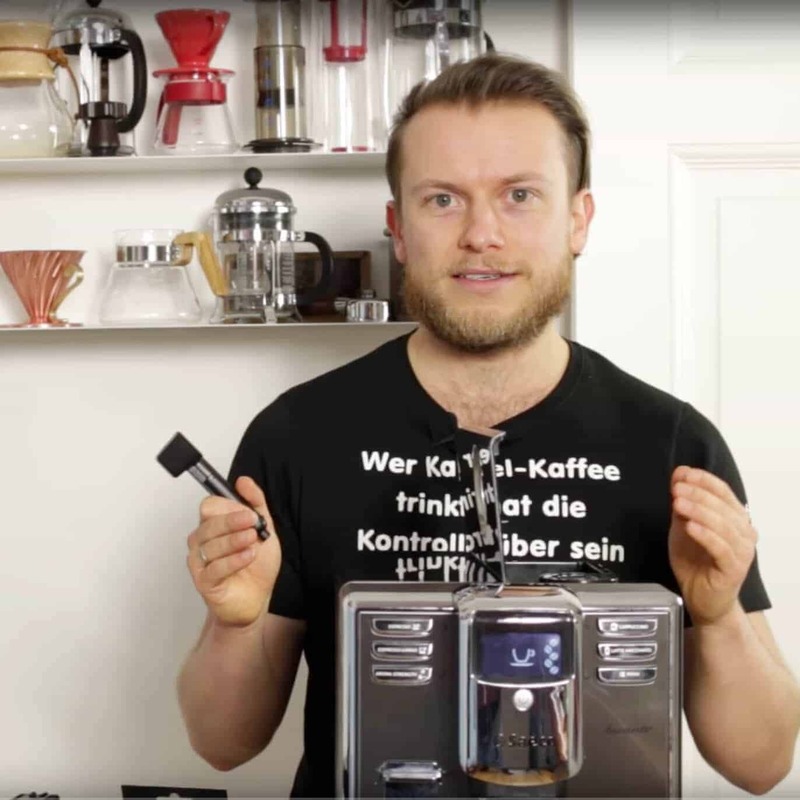 You can find many reviews and reports of coffee beans that I recommend on my Espresso Review Page (unfortunately only available in German for now). Once again, I must emphasize the importance of buying good coffee. Unfortunately, it is difficult to find good coffee in supermarkets. There are a few problems with supermarket coffee. First of all, freshness: By the time the roasted bean are in the store, the coffee can already be old, having been roasted several months before. 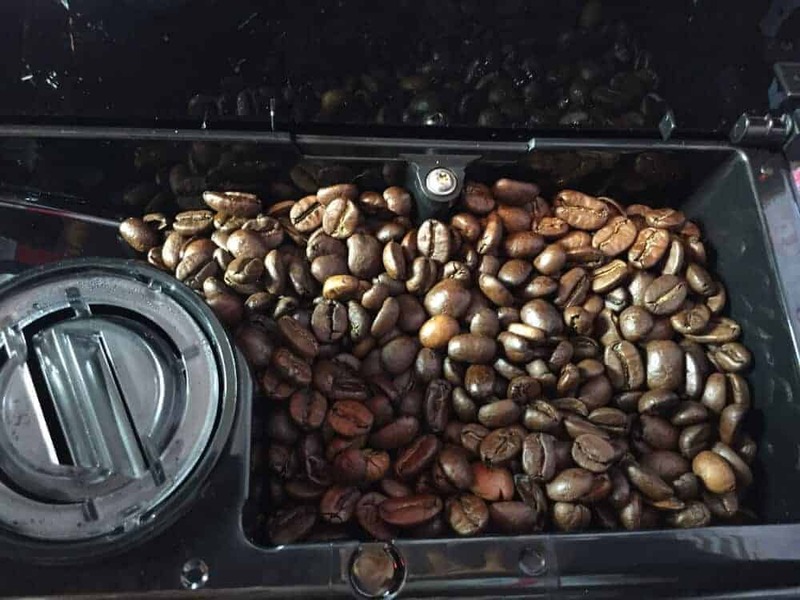 Another problem is that the larger industrial roasters mostly use lower-quality coffee beans. The Gaggia Anima Prestige lets you change the amount of ground coffee used in an espresso. In this case, it’s called “Aroma Intensity.” This whole concept is illustrated, as usual, with a range of one to five coffee beans. As I’ve already mentioned, I made the espresso using the finest setting on the grinder: the extra-strong aroma setting. You can also select the amount of finished espresso you want. There are no levels or numbers, but it is still really simple. First, hold down the button with the espresso cup until the word “MEMO” appears. Now the machine will begin to brew and pour the espresso. Once the desired amount has come out, press the “OK” button to stop the brewing. In my case, I wanted 25 milliliters, about 1 ounce. After using this setting, the machine stored this amount in its memory as the new default. You can also set the brewing temperature to three different levels. I kept it on the default setting, though. When I’m at home, I make regular black coffee by using either a pour-over coffee dripper or a French press. If you want “coffee” – as opposed to espresso – from the Gaggia Anima Prestige, I recommend you make a café americano. To do so, simply brew between two and four espressos, then fill the rest of the cup or glass with hot water. You can get the hot water from the hot water spout on the Anima Prestige, or you can also use an electric water kettle. I suggest making an americano because I think that it tastes much better than the “coffee” settings that you will find on automatic espresso machines. That has absolutely nothing to do with the Anima Prestige – it’s just a general recommendation that I make for all super-automatic espresso machines. If you want to make a cup of tea or an americano, you can easily get hot water from the Gaggia Anima Prestige. To do so, just swap out the milk container and plug in the hot water spout. It slides in easily, and you can remove it again by pressing the side button. If you want hot water, you’ll need to select it in the menu, which lets you choose between milk and hot water. That is all you need to do to get hot water. 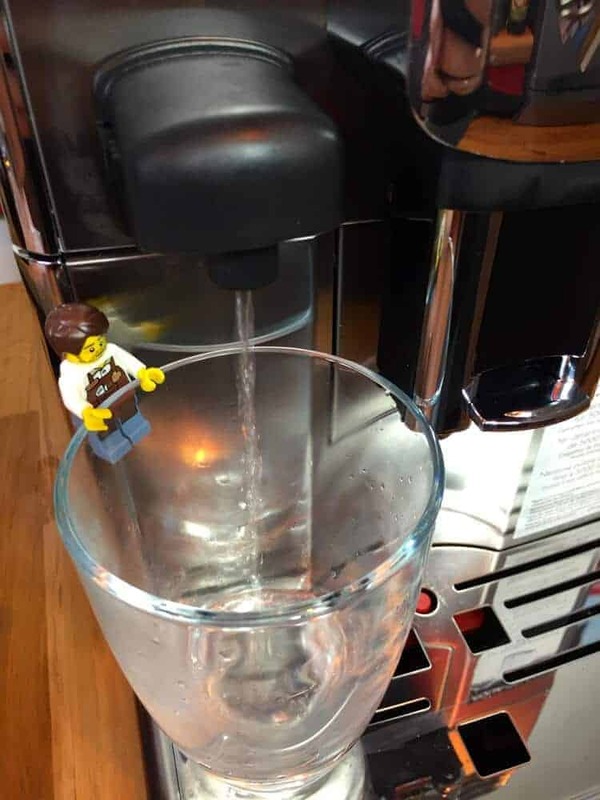 Personally, I don’t use this feature very often because I have a hot water kettle that I like, but many people – including LEGO Barista Larry – will surely find this feature handy. The whole thing is really quick and practical. What’s more, the hot water spout never comes into contact with the milk system, so you will always get clear water – you don’t have to worry about milk clouding it up. This machine has a nice, quiet ceramic grinder. You can only set the grind coarseness while the machine is on. 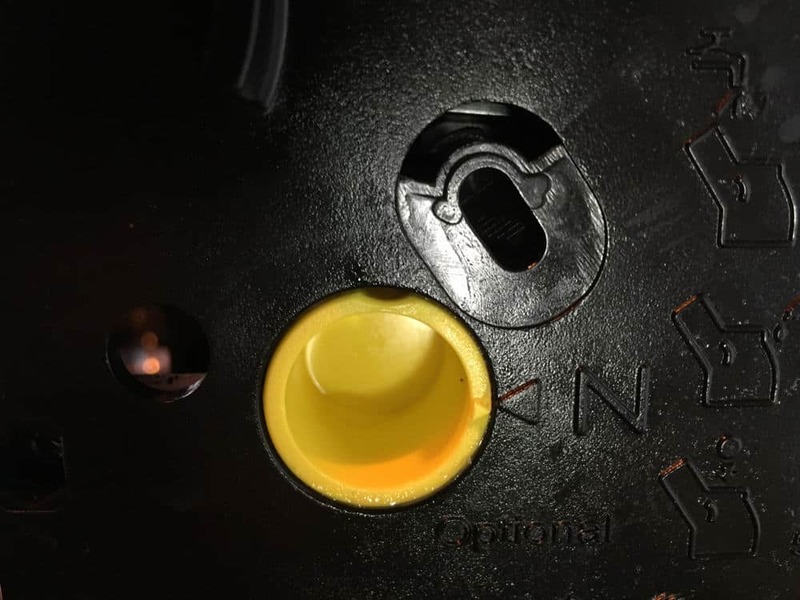 You need to turn a dial in the bean compartment to adjust the coarseness, but you can only do it with a small wrench that comes with the machine (you will find it on the bottom of the coffee scoop). Adjusting the coarseness on the grinder isn’t as easy as it is with most other automatic espresso machines, and it’s actually a little impractical. With a bit of patience, though, it’s not too difficult to set the coarseness. It’s also important to change it little by little: only adjust it one level at a time. Remember that you won’t notice the new setting right away when you make your next espresso. It will take one to three espressos before everything moves through the system and the espresso starts to reflect the new grinder setting. I also have to mention one more thing about these beans: I know they look bad. They are bad, in fact. They’re the beans that I used when I was setting up the grinder, so I didn’t really care about the quality. Of course, the beans that I recommended above look much better. 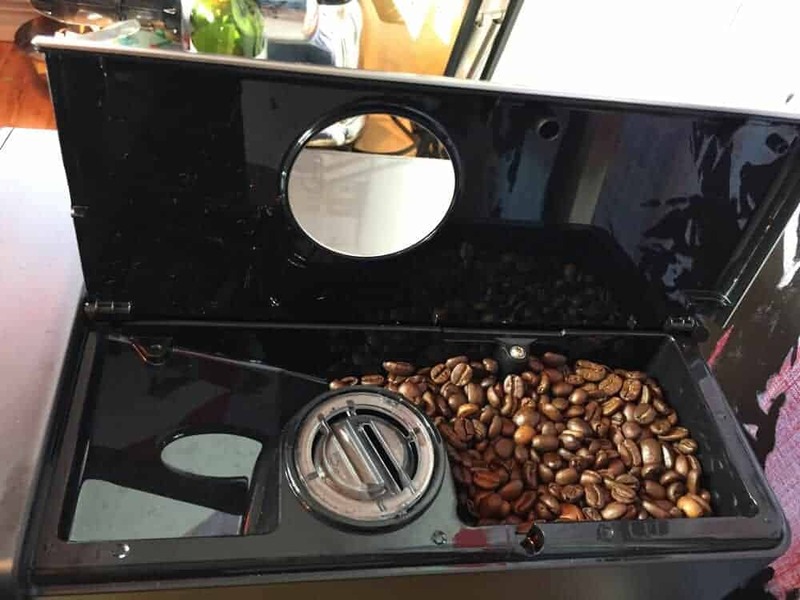 The Gaggia Anima Prestige also has a compartment for pre-ground coffee. In general, I’m not a big fan of these compartments, and that’s true regardless of the manufacturer. All of these compartments have the same problems. 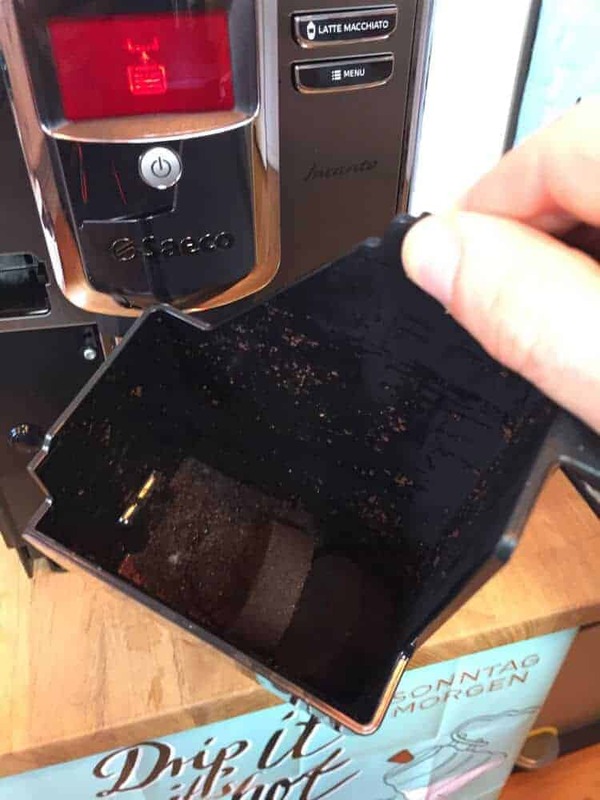 First of all, the ground coffee often sticks to the container’s sides because of the humidity in the machine. You can easily see the water condensation in this picture. Plus, many brewing units can’t handle every kind of ground coffee. For example, some don’t work well with very finely ground coffee. 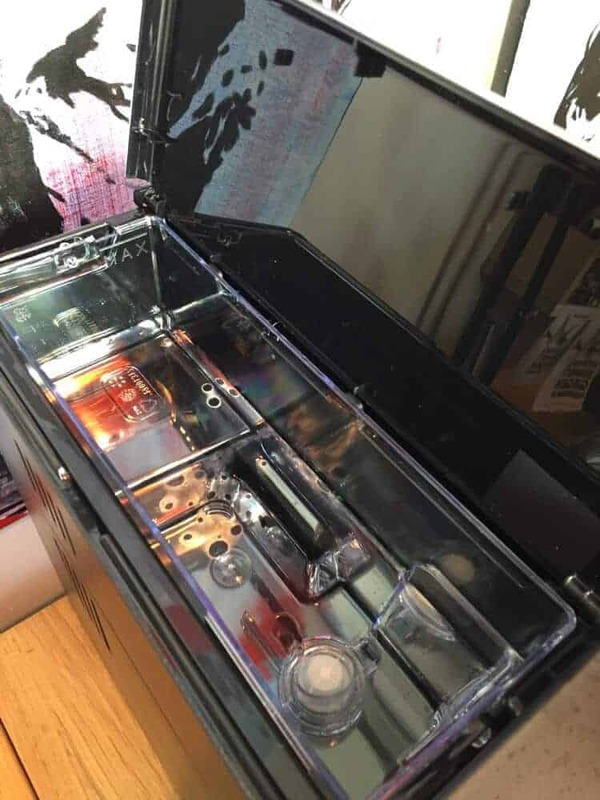 You can use this compartment in case of emergency, of course. I just don’t care for it, but that’s my general opinion and has nothing to do with the Anima Prestige, in particular. After all, the biggest advantage of super-automatic espresso machines is that they grind the beans fresh every time you make coffee. However, that goes out the window when you use pre-ground coffee. By the way, if you are interested in a machine that can hold two different kinds of beans at once, check out my review of the Melitta Caffeo CI, which lets you do exactly that. The spout goes up to about 6 inches (15.2 centimeters), and can be lowered to around 3 inches (8 centimeters). I didn’t have any problems fitting my mugs or glasses underneath. 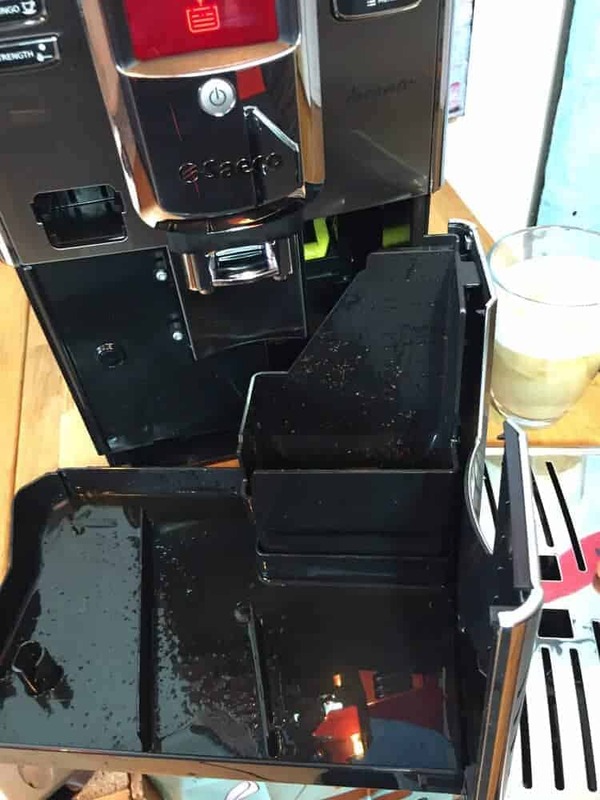 Cleaning is an especially important part of owning any automatic espresso machine. Overall, the Anima Prestige is very easy to clean. Its one drawback is that it takes a bit more effort to clean the milk system. Otherwise, it’s like cleaning any other automatic espresso machine, and it has a normal cleaning program. The brewing unit is also removable, which is a definite advantage. These are the usual suspects when it comes to cleaning an automatic espresso machine. The advantage of this particular milk system is that it hardly takes up any space, but it’s also a bit more complicated to clean because of that. As you can see, you can take apart the milk container. 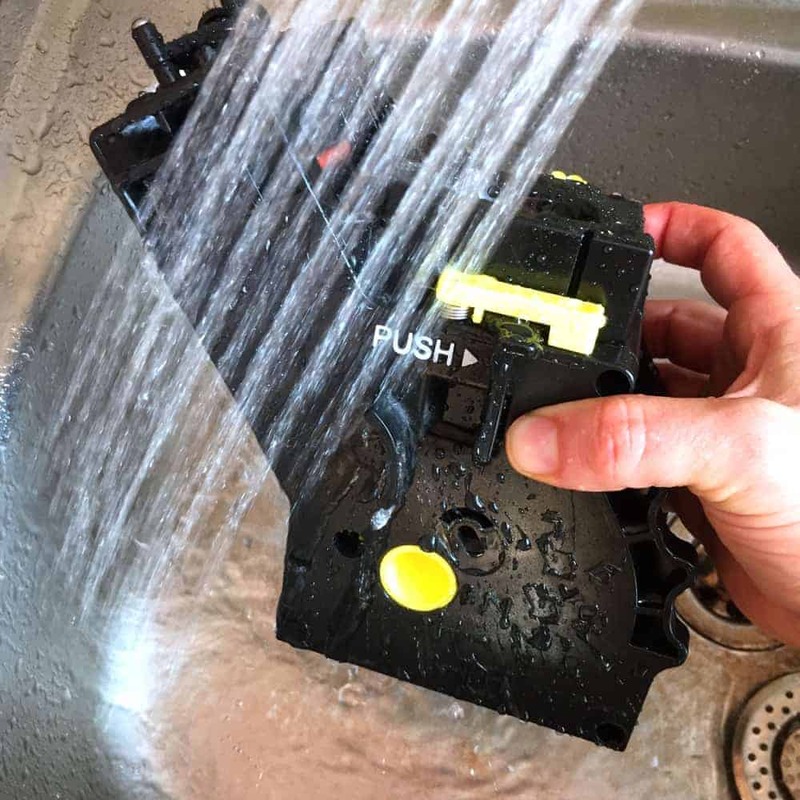 All the parts can be washed out using running water. 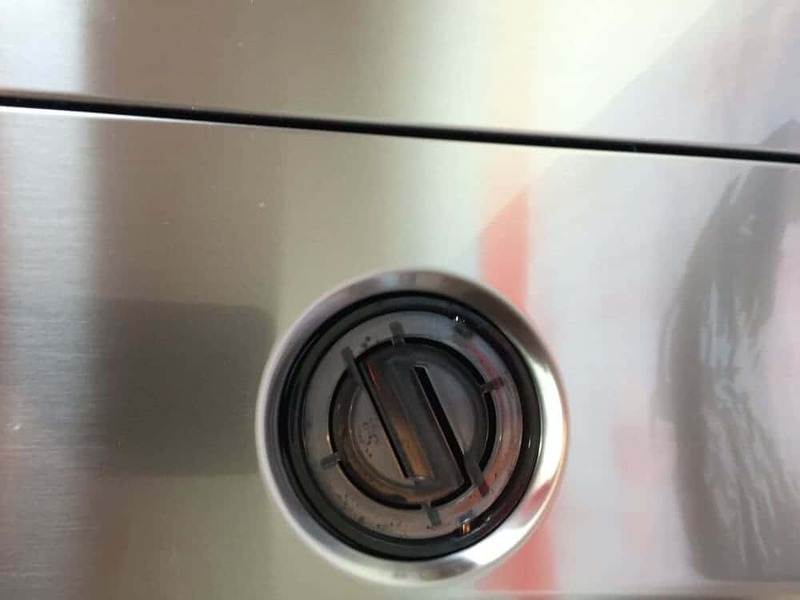 There is also an extra cleaning program for the milk carafe, which uses “Saeco Milk Circuit Cleaner.” According to the manufacturer, you should run the cycle once a month. My advice is to be very sure to frequently clean everything well by hand. I also suggest cleaning the milk carafe thoroughly every time it empties, as opposed to continually topping it off with fresh milk. Cleaning it well only takes about five minutes, and you will have the peace of mind that there’s no old milk gunk in the system. The water tank is about 60 ounces, or 1.9 quarts (1.8 liters). That’s fairly standard, but a bit smaller than you will find on some other espresso machines. However, the small size makes this tank easy to handle. In fact, it literally has a handle that you can use to remove or carry it. As you can see here, the tank is wider and less elongated than you might expect. 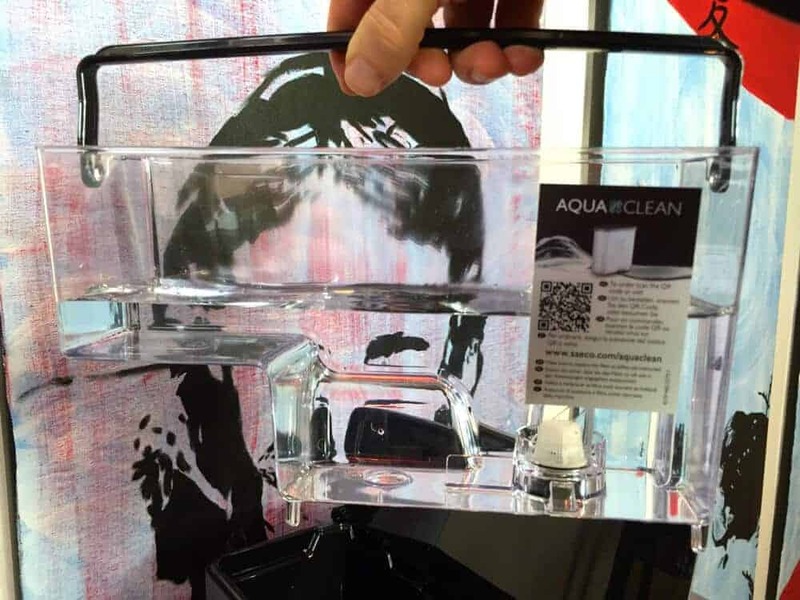 In this picture, you can see where you can install a Saeco AquaClean water filter. 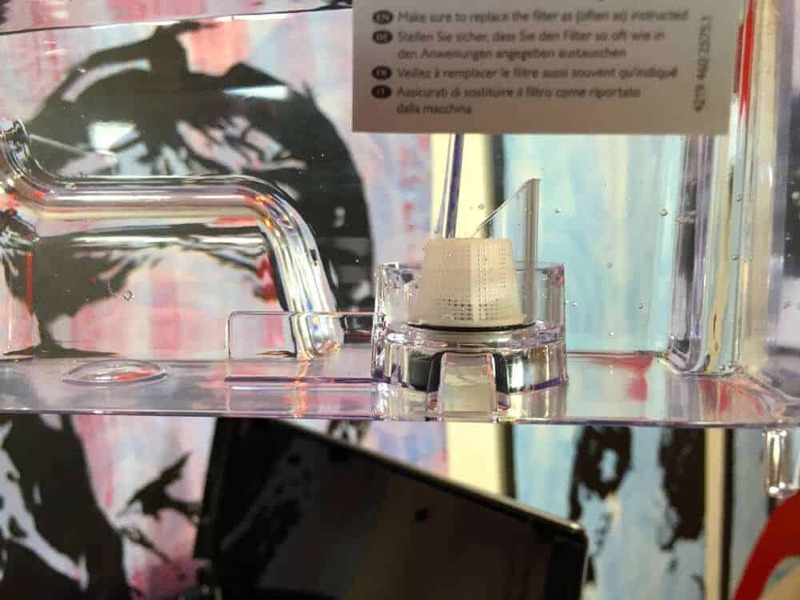 Even the water filter on this model is more compact than the competition, which often have filters shaped like big cigars. When thinking about costs, be sure to include the filters as a recurring cost. You will also need to determine your water hardness – how much calcium is in your water. The more calcium, the harder your water, and the more important it is to use a water filter. You can measure the calcium with a testing strip that comes included with the machine, or you can also check with your water provider. 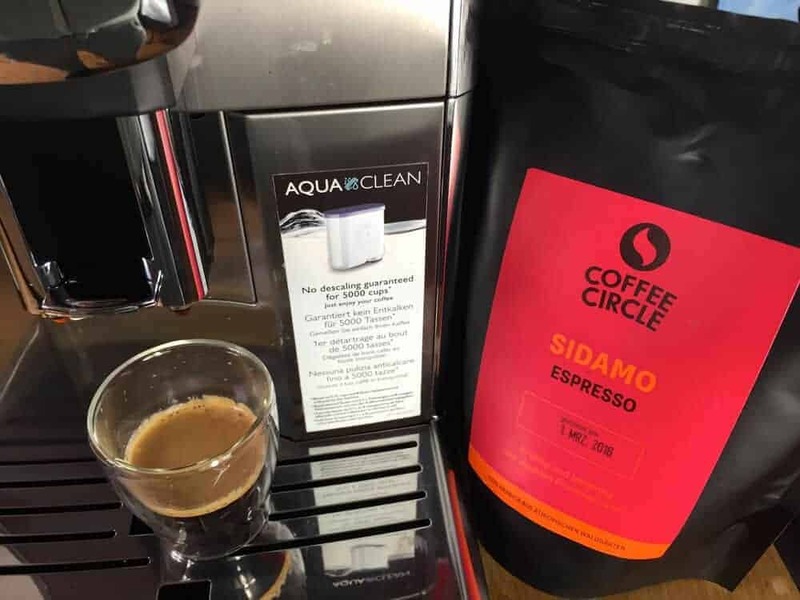 Your coffee will taste better with filtered water. You won’t need to decalcify the machine as frequently if you use filtered water. The following table shows normal levels of water hardness, as measured in the United States. It is easy to take out the brewing unit, especially with a bit of practice, but it’s not quite as easy as with other manufacturers. 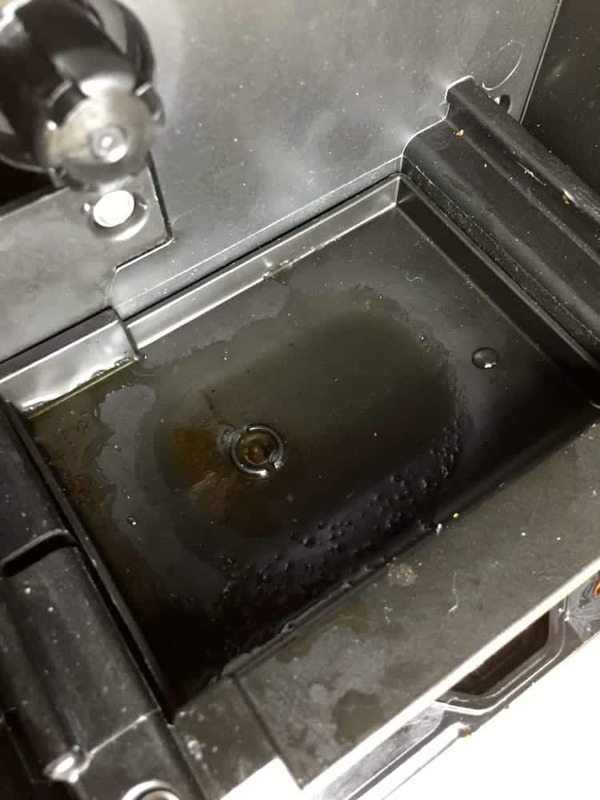 When you removed the brewing unit, you can easily clean it out with running water. Here’s what the brewing unit looks like when it’s inside the Gaggia Anima Prestige. You can see the table through the space where the brewing unit goes. Another drip tray actually goes there. The removable brewing unit makes it really easy to clean the machine from the inside. Here you can see the water and coffee that has dripped down and gathered in the little tray. 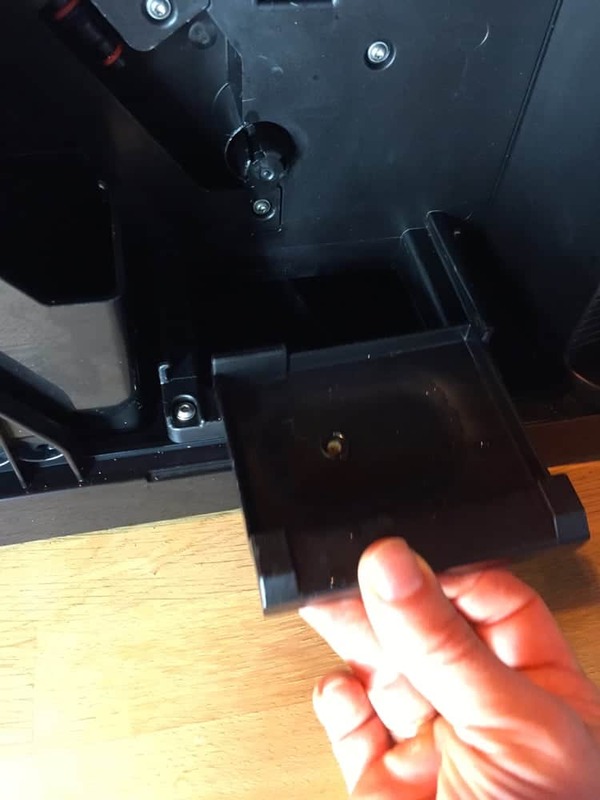 Here is how you slide the tray back into place. It is important to put it in correctly, otherwise the brewing unit can get jammed. It is also important that you put the brewing unit in the correct position. Here you can see a small yellow arrow and a larger black one. These must be pointing to each other, otherwise the brewing unit will get stuck, making it impossible to remove or put in again. The brewing unit is the most common cause of a jam with the Gaggia Anima Prestige. Here you can see the Gaggia Anima Prestige brewing unit (left) next to the type of brewing unit you will find on a Melitta, Miele, Siemens or Bosch machine (right). Both units are very similar in terms of weight and sturdiness, but the design of the Anima Prestige is somewhat more compact. Of course, you can also order a replacement part for the brewing unit. 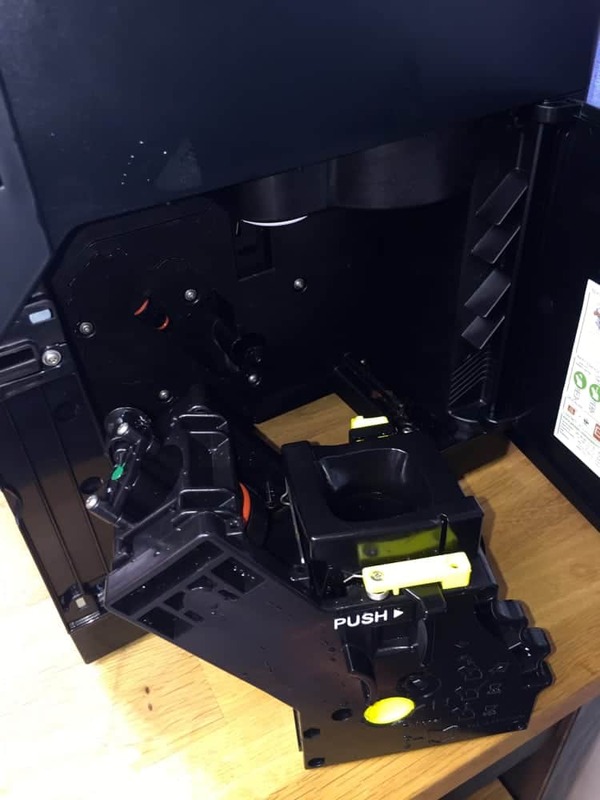 That’s another advantage of this system: If something breaks, you can switch it out for a new part, without even having to loosen a single screw. 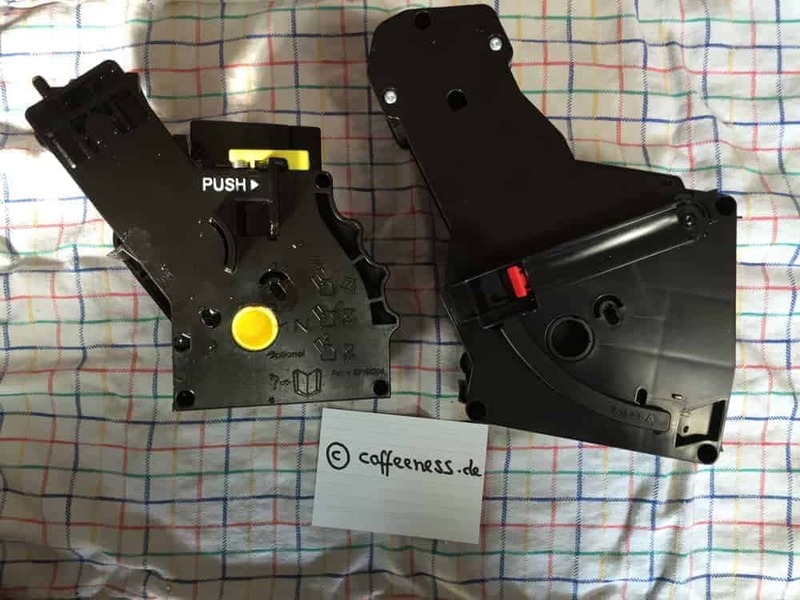 You can easily pull out the whole front of the Gaggia Anima Prestige. You will notice the brewing unit on the right side in the back. In the tray below, there’s a red bobber that indicates the water level in the trip dray. Here’s what it looks like when it has been taken apart. The grounds tray sits inside the drip tray. You can then take out the grounds tray. I would simply rinse out the drip tray and the grounds tray with running water. That’s probably good enough. If something seems to be stuck on, you can also use a sponge with a bit of soap. You don’t actually need to put the parts into the dishwasher, though, and doing so will wear down the materials. Overall, the Gaggia Anima Prestige will give you an extraordinary bang for your buck. It performs very well, especially considering its price. What’s more, you will not find another automatic espresso machine with so much stainless steel in this price range. I especially liked its compact size, the materials (stainless steel) and the space-saving milk system. When compared to its bulky competitors, the Anima Prestige looks really great. Even when I took it out of the box, everyone in the room started nodding in approval. The drink settings worked excellently. I was also very pleased with the espressos it made, and how the amount of espresso was variable. The minimum amount with other machines is usually 30 milliliters (a bit more than an ounce), but here I could dial that down to 25 milliliters. The grinder settings worked well, although changing the coarseness took a bit more effort than with other super-automatic espresso machines. To make up for it, though, the Gaggia Anima Prestige is nice and quiet! Its milk foam system is very space-saving, but it does take a bit more work to clean it. You can easily remove the milk carafe and store it in the fridge. The milk foam is good but not outstanding. The Gaggia Anima Prestige is easy to use. Adjusting the amount of finished espresso was the only thing that needed a quick glance at the manual. Even though it had a few small shortcomings, the Gaggia Anima Prestige won me over. I can definitely recommend it. The balance between price and performance, as well as the design and functionality, are all exceptionally good. You can check the current price on Amazon. If this machine doesn’t seem like the right one for you, I have also tested many other super-automatic espresso machines. You can find all of my reviews here, but here are a couple other recommendations that you may want to consider. 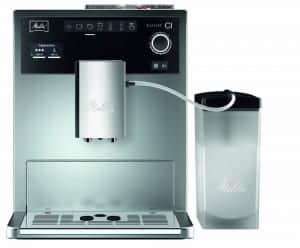 The Melitta Caffeo CI is the first alternative. This super-automatic espresso machine is also in the same price range. However, if you are looking for stainless-steel components, this one falls short of the Gaggia Anima Prestige. It also takes up a bit more space. On the other hand, the milk system is easier to clean, the milk container can go in the dishwasher, and it has two separate compartments for coffee beans. You can check the current price on Amazon, and my complete review of the Melitta Caffeo CI is here. 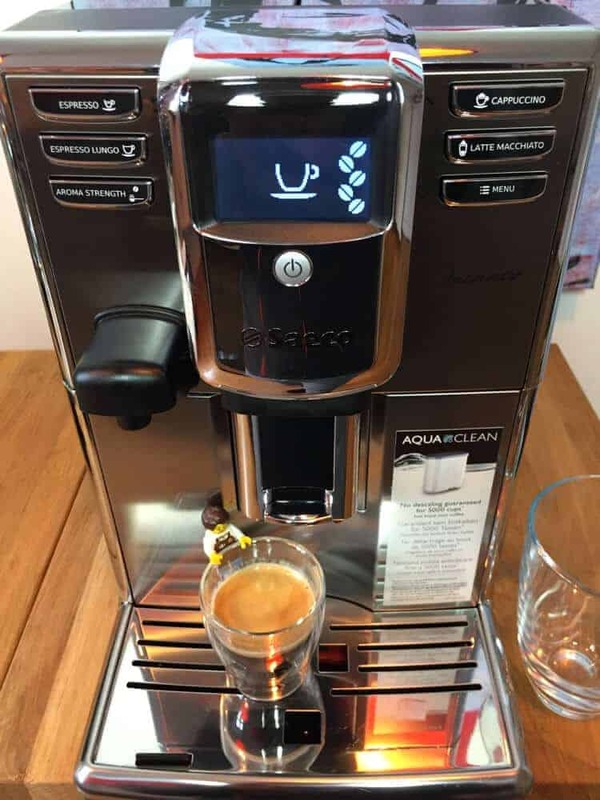 The Siemens EQ 6 is another super-automatic espresso machine that can hold its own against the Gaggia Anima Prestige, at least in terms of design. It is more expensive, though. Still, out of all the automatic espresso machines I’ve tested so far, this is the only one that is quieter than the Gaggia Anima Prestige. The Siemens EQ 6 700 is also a larger machine. I’m now trying to make the decision of what machine to buy to replace it. I think I have narrowed it down to the Melitta Caffeo CI or the Gaggia Anima Prestige. I’ve read your excellent reviews…I’m wondering if it were up to you, which machine would you choose?